Borkeo is a highland area of northeast Cambodia. It’s home to the Tampuan people, a rural minority group wrestling with extreme poverty and illness brought about by waterborne diseases. Mieng is a Tampuan mother with two young girls, and she lives in Borkeo. Her journey for water is a 2-hour endeavor up a slippery 650-foot hillside; she carries 50 pounds on her back on the way down the hill. 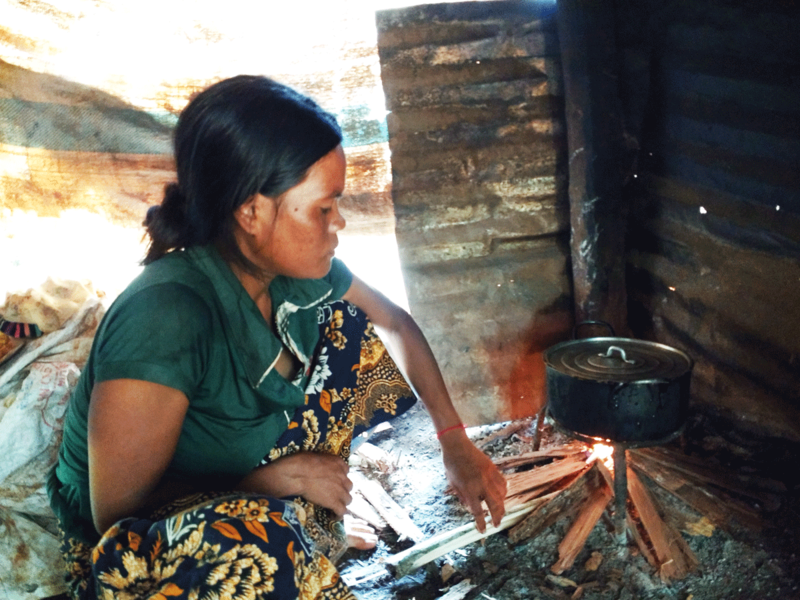 Mieng sits in her home in rural Cambodia. Mieng’s house has no toilet, so the family must use the restroom in the open field nearby. They often borrow money from their neighbors to purchase rice, and rice with salt is the only meal the family will have throughout the day. 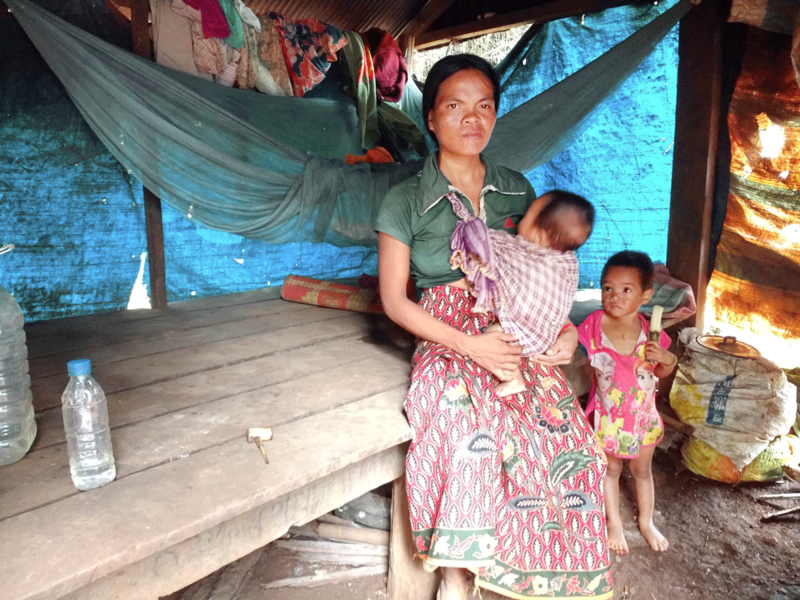 The poor sanitation conditions, unsafe water, and insufficient nutrition make Mieng’s family sick. Mieng cooks rice for her daughters. While the water crisis is improving in urban areas of Cambodia, the challenge is significant in rural regions like Borkeo. In fact, 90% of those most vulnerable to waterborne illness and poverty live in rural, hard-to-reach places. About half of Cambodia has access to a basic water supply, but only 24% is safely-managed water. Of the 15.6 million people in the country, more than two million are still using surface water for drinking. Only half of the population has access to an adequate toilet and an astonishing 6.4 million people are still practicing open defecation. The water crisis is even more pronounced in Borkeo. Learn more about the Cambodian water crisis. These numbers can appear daunting, but together, we can restore hope to Cambodia. 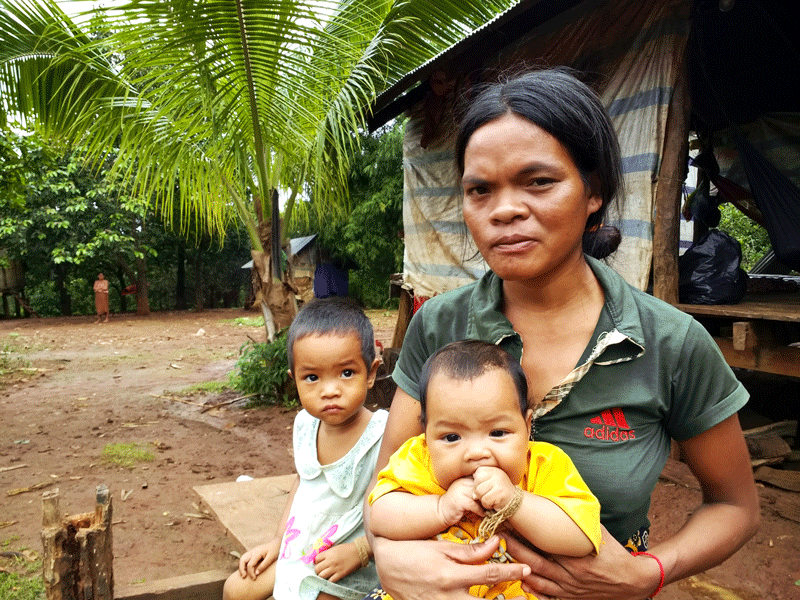 Mieng, and other mothers in Cambodia, need your help. Your gift will give clean water to Mieng’s family and thousands more like hers. It will provide for toilets near their homes, safe water, and sanitation and hygiene training for families that suffer from constant sickness. Families will have the opportunity to take charge of their own health, attend school, spend more time working rather than collecting water, and hopefully, thrive as God intends. To date, we have helped nearly 15,000 people in the Svay Leu district gain access to clean water along with improved sanitation and hygiene. Mieng sits on a bench outside of her home with her two young daughters. Our new program in Borkeo will serve more than 7,000 people in the first phase alone. In the next five years, we aim to help more than 100,000 people in rural Cambodia gain access to clean water and improved sanitation and hygiene. You can help give children in Cambodia a future beyond poverty. See Cambodia on our interactive maps.